This is the second day of final level of competition for the 4 young artists who made it to the Finals of The Voice Kids Philippines with hashtag #TheVoiceKidsFinale since they will be competing live on July 27, 2014. The four kids will face each other on the live finale at at the Resorts World Manila, Pasay City on Newport Performing Arts, Theater. The viewers have a part in choosing the winners for the said competition. The grand champion will receive 1 million pesos plus a recording contract of one year from MCA Universal. The Voice Kids has finally reached its final episode as it already announced its grand champion which is first ever in history. The young artists started with draw lots to know who among them will go first and then the second, the third and the last and the result was Darren went first followed by Darlene, then Juan Karlos and lastly, Lyca. 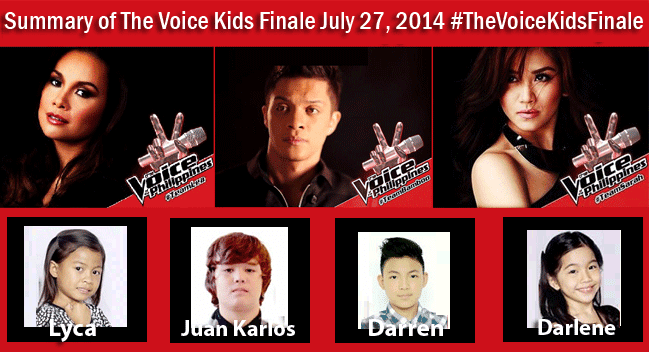 Who will be the winner for The Voice Kids PH 2014 Edition? Lets find out this Weekend! 1. Watch Darren Espanto performed 'You Are My Song' on The Voice Kids PH Grand Finale as of Saturday, July 27, 2014 at the Resorts World Manila, Pasay City on Newport Performing Arts, Theater. With Darren’s performance, he sang “You Are My Song” having a duet with none other than Martin Nievera. Darren and Martin did a great partnership on stage as it started with Darren playing the piano and Martin was singing. When Darren let go of the piano, he sang beautifully with a crystal clear voice. Coach Sarah said that Darren deserved to be the winner. She also thanked Martin Nievera for supporting Darren. 2. Watch Darlene Vibares performed 'You Don't Have To Say You Love Me' duet with Lani Misalucha on The Voice Kids PH Grand Finale as of Saturday, July 27, 2014 at the Resorts World Manila, Pasay City on Newport Performing Arts, Theater. Next one was Darlene with her mommy as her inspiration. Darlene sang “You Don’t Have to Say You Love Me” along with none other than Asia’s nightingale Lani Misalucha. Lani did a great performance with her very powerful voice along with Darlene who really expressed confidence on stage. Coach Lea said that it was the greatest performance of Darlene in the entire competition. 3. Watch Juan Karlos Labajo performed 'Eto Na Naman' on The Voice Kids PH Grand Finale as of Saturday, July 27, 2014 at the Resorts World Manila, Pasay City on Newport Performing Arts, Theater. Juan Karlos was the third performer of the evening and he was paired to Mr. Pure Energy Gary Valenciano. During their training, Bamboo was impressed on how Gary V. did his best to make Juan Karlos better and he performed well on finals with the choreography. What Juan Karlos or JK did was not easy. He and Gary V. performed “Heto Na Naman” wherein they danced while singing. Bamboo expressed his gratitude towards JK’s cooperation and listening ability. 4. Watch Lyca Gairanod performed 'Basang-basa sa Ulan' on The Voice Kids PH Grand Finale as of Saturday, July 27, 2014 at the Resorts World Manila, Pasay City on Newport Performing Arts, Theater. The last but not the least was Lyca who for a moment became the fourth member of the band Aegis. Lyca sang the Aegis hit “Basang Basa sa Ulan” that made the audience go crazy. Lyca as what we all know is a the daughter of a scavenger and this talented kid did her best to be where she was. While Lyca was singing, her mom was crying and after her performance, coach Sarah shouted “that’s my superstar!” She asked Lyca if she knew that she was in the grand finals and she answered yes. Coach Sarah then added that she performed more than a grand final performance but it felt like her concert. Lyca Gairanod is the First Ever The Voice Kids Philippines Grand Champion. Next in the rank is Darren, followed by Juan Karlos and then Darlene. anong kanta ung background music nung concert nung iniiiuntruduce ung mga judges?